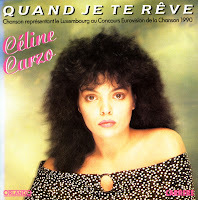 Céline Carzo represented Luxembourg during the 1990 Eurovision Song Contest. It was one of the most dynamic songs Luxembourg had ever contributed to the Contest. After it finished 13th in a field of 22 competitors, I lost hope that this song would be released in the Netherlands. All I could do was search for the single that was released in Luxembourg and/or France. Someone I knew actually bought a copy in France, but he also told me it was very rare. Indeed, it took me seven years to find this single. I was pleasantly surprised to find that the single version lasted for 4 minutes, 1 minute longer than the maximum performance time during the Contest.